Investing in the right equipment will give your bindery a competitive edge. Digital print has enabled many printing companies to do short-run book production. Perfect binders and hardcover book production systems have become increasingly geared towards this type of production. It may leave you wondering what type of bindery equipment you should invest in to create a bindery that is competitive and long-lasting. The answer is to invest in a high-speed, high-tech binder that will give you a competitive edge for many years to come. Here are a few of our suggestions for creating the best bindery. A decade ago, it was common to have to fine-tune a big binder as production went along. This would require stopping the machine to adjust feeders, spine preparation, the cover feeder, and many more elements. With today’s technology, that kind of stop-and-go binding is unnecessary. Machines like the Sterling Digibinder are completely self-adjusting. A pneumatic clamp and nipper adjust automatically, and a compressor is included. You can bind a thin book, then a thick book, and vice versa. This means that production can run smoothly and efficiently without having to stop to make adjustments. Similarly, the Coilmaster Jr. TS automatically inserts plastic coil through the first hole onwards and then cuts and crimps itself. 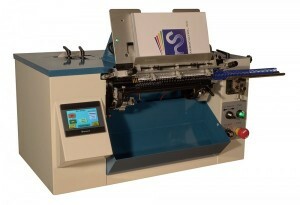 This affordable machine makes a great addition to a long-lasting bindery because it can coil up to 600 books per hour! Having reliable, fast-moving machines in your bindery is a sure way to increase production and give your company a competitive edge. Now the question is: do you want to buy your equipment new or used? The decision is ultimately up to you. Buying used will often allow you to purchase equipment that functions well and will continue to do so for years into the future. However, you do still run the risk of used equipment not lasting as long as you had hoped. It’s a good idea to make sure that the company you buy your used equipment from properly inspects it before selling it to you. At Atlantic Graphic Systems, we make sure that all used equipment is functioning properly and up to our standards before allowing it to be sold. If you want to buy new equipment, you will obviously be spending more money. But the payoff is that your equipment will have all the latest technology, which could give you a more competitive edge over other companies who choose to buy used. This entry was posted on Friday, April 8th, 2016	at 3:14 pm	and is filed under industry practices, New printing equipment, Used printing equipment	. You can follow any responses to this entry through the RSS 2.0	feed. Both comments and pings are currently closed.